Rand, if memory serves, not only did you postulate FH for a Europa mission, but you mentioned the Star 48 for it too. Since then, we’ve seen the Parker Solar Probe launch on a DIVH with a star 48 as a kick stage. The Star48 and probe were both “payload” inside the fairing. I hope this happens. FH would be vastly cheaper. Imagine if you stuck a fully-fueled Centaur on top! The LH2 infrastructure should still be available at 39A. 1. I strongly suspect that JPL planners did the calculations with a Star 48 kick stage a long time ago – but as you say, they now feel a little more comfort talking about it in public. 2. Richard Shelby will have his usual litter of kittens when his staff shows him the Berger article today. And an angry phone call over to Bridenstine will undoubtedly elicit another public statement that NASA is “fully committed” to launching Clipper on SLS. Still, the fact that this option is out there, and the radical differential in cost, will mean it at least gets put into the mix in the next round of congressional hearings on Europa Clipper, and Shelby will at least have to expend some political capital to defend this. Keep pushing on the wall, and eventually it might come down. 3. I likewise would love, love, love to see an orbiter sent to Enceladus (though using FH would undoubtedly mean a very long journey with multiple gravity assists). For the money you save on EC by NOT using the SLS, in fact, you could afford one! But this is where we are. Europa had a mighty congressional patron, and Enceladus did not. Take what you can get, and hope that you can try again for Enceladus down the road. The proliferation of lower cost heavy lift launch options in the coming decade certainly won’t hurt. The solution to avoiding GAs is propellant depot. Pity NASA isn’t working to jumpstart one. Of course, that would just be one more nail in the Senate Launch System coffin. You need a lot more than a few probes/decade to justify a propellant depot. If the fairly substantial traffic to GEO doesn’t justify one it’s hard to see how the trickle to the outer planets could. That would depend on the cost of the depot. If it is more or less an upper stage with some mild modifications to load and offload propellant, it might could be done within the cost of a single mission. If it becomes a major development project in its’ own right, then you are correct. My problem is that I just can’t see how depot development would be all that expensive. I can accept that it is a blind spot for me, but I can’t figure out where the problem lies. I’m disgusted by your item #1, Richard, because I think you are exactly right. Enceladus’ liquid ocean is quite a lot smaller than Europa’s. 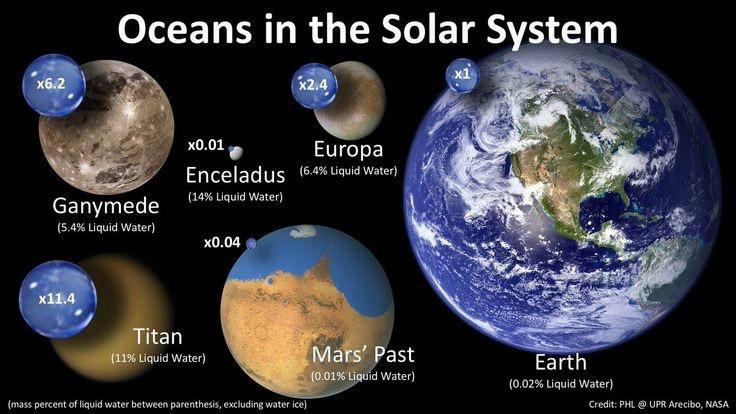 I would give better odds of Europa having life. Carolyn Porco strongly disagrees. It’s not obvious to me that ocean size is as big a factor as radiation and other things. I think the least we can say is that it’s not clear cut which is more likely – we lack too much data. Of course, my solution would be send orbiters to BOTH, presumably from the money I save by not launching anything on SLS. Of course, I know appropriations don’t work that way. We’re still making up lost ground in planetary science from the funding cuts over the past decade. And yet, this is the one area where NASA indisputably provides real bang for the buck. What think about idea of the radiation creating oxygen in the ocean? Why would anyone rely on a rocket made by Californians when SLS uses boosters made by non-drinking, non-toking Mormons in Utah? Heh. You don’t know many Mormons, do you? Re Rand and depots: Yes. Indeed. I sent a back of the envelope calculation about FH to what’s his face several years ago. I could dig out the email. He emailed back to the effect that they were committed to SLS. Of course. In Other News, apparently space sculptures are now a thing. What would be the result of stacking two boosters for the BFR? Could you burn just two or three of the engines for longer duration and get to Any of Jupiter’s moons in months instead of years? Or is the BFR booster not stackable? It’s probably, with a lot of engineering, stackable (One atop the other). Getting it off the ground would be IMHO the problem, due to it being unable to do so (the stack would outmass the available thrust of the lower BFB). IMHO, an option might be using the BFB/BFS stack, but with a stripped down BFS, making it just a second stage (without the nose section, heat shield, etc, etc.). Atop that, put a F9 2nd stage as a 3rd stage. If the numbers for BFR are anything close to accurate, that ought to allow pushing the F9 2nd stage plus a few tons of payload through escape velocity before the F9 2nd stage even lights. I was thinking a complete BFR with two stacked boosters assembled in LEO, refueled by repeated launches, and once topped off, a much longer burn is possible with a sacrificial stage either part-way, or once in Europa orbit. Getting a booster stage into LEO would be quite a feat. Though if the mass ratios I recall quoted for Falcon 9 carry through to BFR, the stage without payload might just make it SSTO, and need refueling to go any further. Don’t forget, there’s also supposed to be a cargo variant of BFS. How much dV could you put towards the outer planets and still get the BFS back on a return trajectory after it pops whatever hatch it has and soft-deploys the probe and whichever third/kick/etc. stages it needs to go the rest of the way? What if you refuel the cargo BFS from the tanker variant in LEO before making the interplanetary burn? There’s an even more radical option, as well–buy an entire BFS (pick your favorite variant) and outfit it as the largest unmanned probe ever built (I bet you could fit a KiloPower reactor plus shielding and radiators in it, too). Sadly, that would probably still be cheaper than a single SLS launch under any realistic scenario. So there were ads running against Culbertson for his support for space exploration… so much for the Party of Science™, eh? Not just the ads, but even the Houston Chronicle endorsement editorial ripped him for his Europa interest. To their credit, most of the (left-ish) comments in Eric’s combox ripped the ad as stupid, but are still glad Culberson lost, because he was a climate change skeptic, and, uh, TRUMP.